The plan had been to go to the garden centre. My diminutive six year old nephew looked unimpressed. Flowers did not float his boat. Immediately, he beamed. A vegetable, Now why didn’t I say so before? “A vegetable,” he announced with a flourish. “A tomato!” Al pronounced joyously, and we went to get into the back seats of my car, which are especially small enough for diminutive six year old boys. It being a new-to-us car, we had not used the Al-seats at the back before, and when we checked we found the Al-seats did not actually exist. And we had no booster seat. A trip to the garden centre was out of the question. And he shot off though the front door, heading for the soil at the back of the house. Two minutes later, there was a large hole in a flowerbed and an extravagant heap of soil scattered in an impressionistic arc behind the small industrious digger in my back garden. It was not long before he decided the hole must not just be any hole: it should have a purpose. We buried treasure in it, using a plastic biscuit tub. I searched for it and found it. The tub got impaled several times on the fork. And then, Al hit on the idea of filling the pots in my garden with soil and planting things. 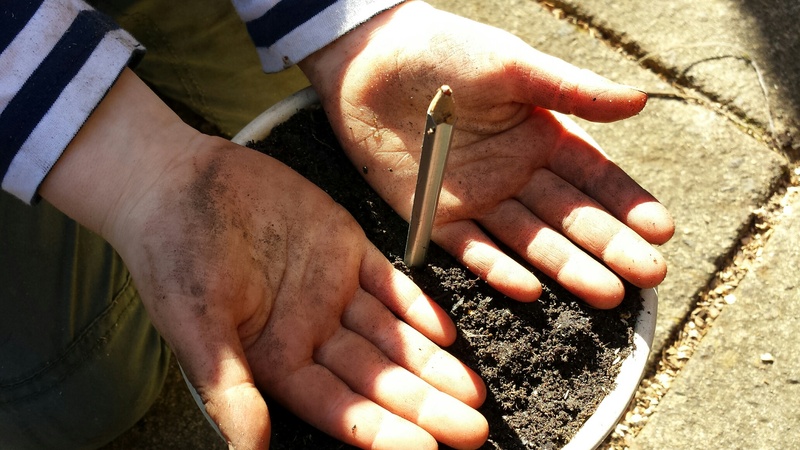 He found a tall thin pot and filled it with perfectly graded soil. But though I rummaged through the shed for what seemed like aeons, I could find not one single solitary seed. It seemed not to signify. “Look Auntie Kate: I planted something!” he said, and when I turned round, I saw Al had planted a stone in the centre of the pot. Very Feng Shui. We stood admiring the first Planted Thing of the new season. But there was a hitch: we couldn’t experience that growing moment. The one when the shoot emerges magically from the soil. Al, as usual, had an answer. Pottering inside our house he rummaged until he found a pencil. He planted this with a measure of ceremony. “Look Auntie Kate, a growing pencil!” he said, and proceeded to make it grow several times for my benefit. Later, on the way to the playground, we passed two impossibly blowsy pink cherry-blossom trees. And suddenly Al was not by my side any more: he was away under the trees, gathering blossoms as though his very life depended on it. “Are they dead?” he asked me with typical directness, when he returned with a fistful of blossom for me. “They’ve done their job and the tree doesn’t need them any more, Al,” I hazarded. But under further interrogation, I owned they were, indeed, dying. That dismayed Al. “I wish we could put all the blossom back on the trees!” he declared passionately. Oh, Al. So do I. And I wish we could bring back the lives that have left us, and grow young and lithe once more, and I wish pencils could grow on trees. But life gifts only where it chooses, and it travels only in one direction. But we can look after it. 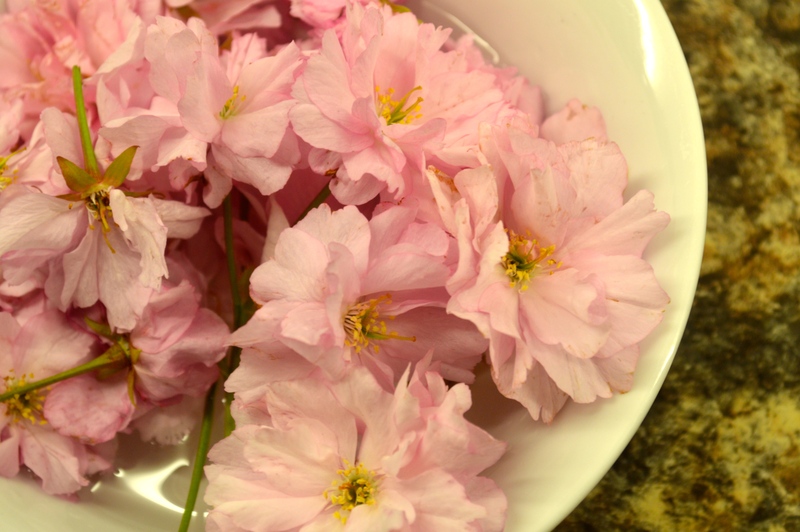 And, cosseted on my kitchen windowsill, a fist full of blossom sits in a bowl full of water, enjoying unaccustomed longevity. Posted in Big AlTagged Big Al, Britain, chldren, family, gardening, soil, spring, UKBookmark the permalink. oh Kate, how it would be if we could allow those gone before us to blossom again. You said it, Sidey. *Sigh*. So sweet, Kate. These moments with Al “in first bloom” are so magical. He is still as childlike and inquiring as he was at 3, Nancy; and deeply intelligent. Great company, all in all. I so agree with those sentiments…the “I wish” ones and particularly the pencil tree. Many years ago, for some client who was happy to part with a lot of his money, I hired people to wire artificial leaves onto a tree in winter …a lot of leaves. I also remember a client wanting perfect cherries at some impossible time of the year. We found some and had them flown to us…each cherry ( without the cost of airfreight) worked out at £75.00…and that was in the ’80’s ……I wish……. Good gracious. That IS a lot. But if anything could be worth £745 a pop it would be the divine, vampish cherry. Love them to bits. By the way, is that the Inigo Jones staircase on the heading of your handsome new blog? Nope – it’s the Christopher Wren staircase at St Paul’s. On the right before you get to the cathedral proper and the no photography ban. I just love Wren. Children can come up with simple answers. Al is such an optimistic little gent, Kate. That kid makes me smile. When you referred to “the small industrious digger in my back garden” I first thought that Mac had joined in with his special brand of excavation. The dog doesn’t do digging unless there’s a bone at the end of the exercise, Virginia. Anyway, he’s far to busy playing Houdini right now. Of which, more anon. He has a true spirit of enterprise! What did away with the extra car seats? I don’t follow that bit. But those blossoms are now giving pleasure to many! Col, there was nothing to follow: we like seven seater cars. We buy them cheap and run them hard for a couple of years; Mercedes are faultless right up to 200,000 miles. Phil picked up our latest car from EBay. It is a dream: runs like its on rails, accelerates like a sports model. Trouble is, Phil forgot to check the back seats – the final two where the hatchback bit is – were installed as usual. The one lady owner bought the car new and commissioned, not just a supercharged gearbox, but no rear seats. We found out when we went to put Al in…. That must be quite a record. Overlooking a little thing like no seats where you expect to find seats! I’m sure Phil would have checked to see there was an engine to go with the gearbox, though! Phil forgot to check the new car had seven seats, MTAC. We are now a five-seater family, at least for the time being. Big All has the heart of a gardener and the soul of a mystic. From a pencil plant to the savior of cherry blossoms, perhaps a bit of a prophet as well. I wish I could approach my problems with such optimism. Oh Kate…I’m sorry…the comment above was meant for your barking dog story….sorry….don’t know how to move it. Hi Judith, not at all! 🙂 Duly deleted, and I see you have a comment up on the other post. Many thanks for your perseverance.